Jeffrey William Steven Funnell - Edmonton's Burial & Cremation Professionals | Trinity Funeral Home Ltd.
Jeff passed away peacefully with Kim and his girls by his side on January 11, 2018. Jeff will be greatly missed by his wife Kim, daughters Hannah and Caitlyn, his parents Ron and Lyn , his sister Dianna, nephews Quinto and Elijah and brother-in-law Raymond Lavallee. 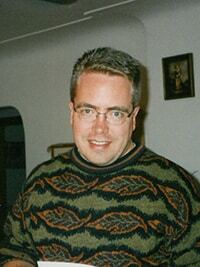 Jeff was predeceased by his daughter Abigail and his sister Wendy Lavallee. Jeff enjoyed volunteering in the school and community. He loved celebrating his Canada Day birthdays and thought the fireworks were just for him. He was also proud of his family’s Edmonton Eskimos heritage and was a huge fan. We will miss his fierce dedication to his girls and his quick wit and sense of humour. He made us all laugh and was positive until the end. The family expresses a special thanks and appreciation to the staff at Foyer Lacombe Hospice and to Dan Allen and staff at Dolar Drug. A very special thank you for all the caring and support from the staff at St Charles Elementary School. Donations in memory of Jeff may be made to Foyer Lacombe Hospice at #1 St Vital Avenue, St Albert, AB T8N 1K1. Mark Jordan from Woodstock, previously from Cambridge will absolutely miss him and cherish his positive attitude even when all the deck was stacked against him. I was so sorry to hear of Jeff’s passing. I only knew him for a short while as a colleague at Edward Jones and I found him to be a very nice person to know. May God comfort you in this difficult time. My thoughts and prayers are with you.